4YourCNA Courses – We make CNA training easy! What is an Online CNA Test Prep? *With purchase of Skills Book “CNA Skills Made Easy”. Voucher code for free course enrollment is found inside front cover. Without skills book purchase, enrollment is $29.99. 4YourCNA is the number one CNA Test Prep organization on YouTube! Over 13 million views…and counting! You need to pass the test…we know how. Enough said. Home, car, work, school, the park, the mall, at your mom’s…where you are is where WE are. Our online classes go anywhere. Click the link…yes, you see it up there…bright green…viewing the lessons will say way more than we ever could! Our online test prep program is just right to help you prepare for the exam, whether you need a quick brush up, a full crash course or a comprehensive program to prepare you for the test – we’ve got it covered! It's FREE! Or only $29.99 - your choice! CNAs are in demand. Jobs are available right now. But you need certification to get those jobs. This program is real. It will REALLY teach you what you need to know and we are here to support you as you learn. And in Florida, anyone can challenge the CNA exam with NO CLASSROOM OR CLINICAL experience required! So, what are you waiting for? Our skills book is an integral part of our program, so if you buy it, you will have free access to the course. Don’t want to buy the book? No problem…the course is only $29.99 by itself (but you are missing out on super-important info). View our free lessons to see for yourself how easy and fun online learning can be. No boring reading here…take a look! Classroom training is outdated, inconvenient....and only as good as your teacher. We have spent a decade studying the test and we prove it. It's time for a new way of learning. Your future starts here. All right here, within this course! If you are not in a Prometric Testing State, these lessons cover basic nursing standards that will prepare you for testing in ANY state! Then this program is made specifically for YOU! 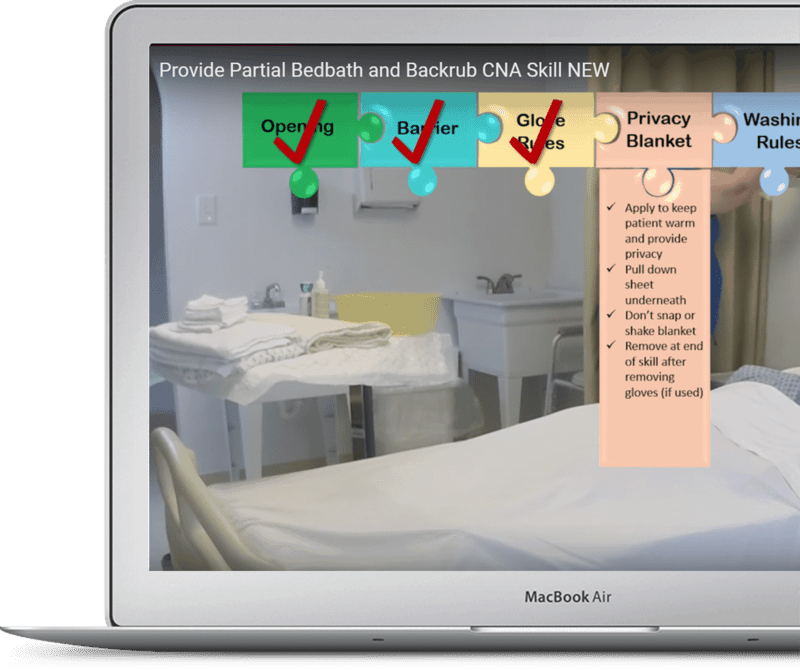 Videos, interactive lessons, activities, test-specific content, and FREE…all from the leader in CNA Training…you’ve got to see this to believe it. We've got 'em. You need 'em. Enough said. We show you how, step by step and give you all of the reasons WHY behind each step. Learn the supplies and the steps before you begin to practice for greater confidence.